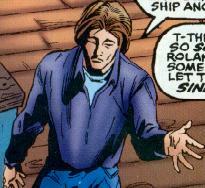 Powers/Abilities: Roland Taylor possesses the Uni-Power, a source of immense cosmic power. Although the full capabilities of the power are not necessarily known to him, he has demonstrated the ability of flight, to transmute one object into another, and project energy beams. History: (Cosmic Powers Unlimited#5/2)- Roland Taylor was a divorced, schitzophrenic freelance writer, driven in his despair to ending his life. 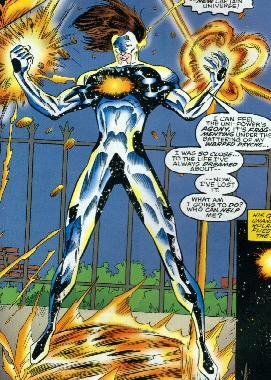 However, before he could pull the trigger on his gun, he was possessed by the Uni-Power and became Captain Universe! The Uni-Power healed his schitozphrenia, silencing the voices in his head. Excited, he set off to find his ex-wife. Roland attempted to get back together with his ex, Lucy, but she found his newfound sanity difficult to believe. Still, Roland believed he could convince her he was fine given time, but he attacked shortly thereafter by the Wraith Squad, an elite force sent to capture whoever possessed the Uni-Power. Despite his inexperience, Taylor fought back, and defeated them. Comments: Created by Eric Fein, Neil Errar and Don Hudson. It was likely hoped that Taylor's story would continue as a regular back-up feature in Cosmic Powers Unlimited, but as#5 was the last issue, Taylor never reappeared. For all we know, he's still hoarding the Uni-Power.